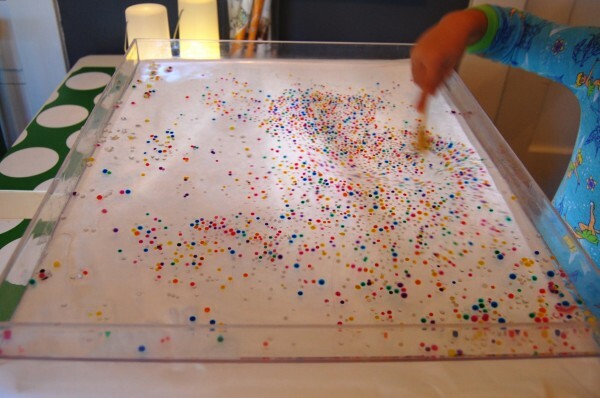 Have you ever played with water beads? 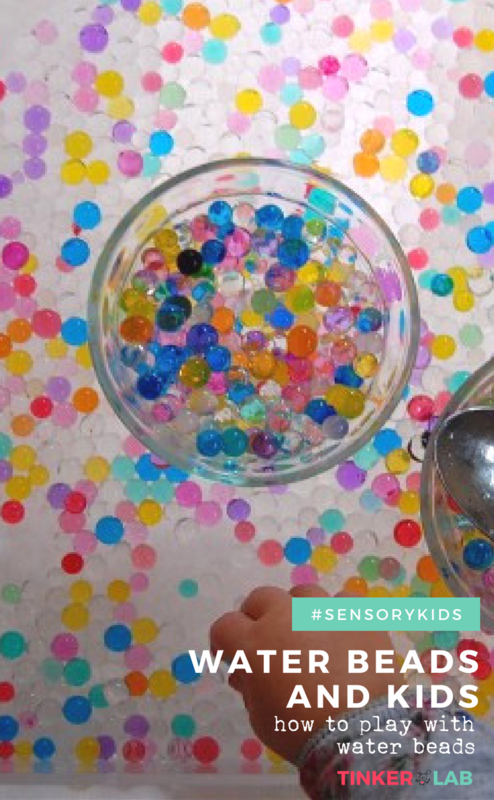 They’re slippery, squishy, and a surprisingly fun and addictive sensory experience for kids of all ages. 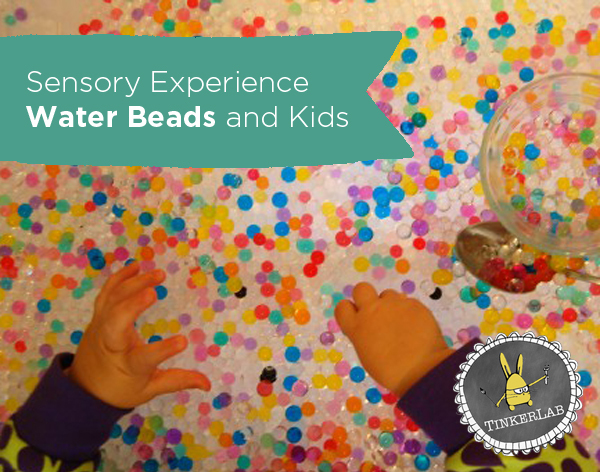 If you’ve been to the craft store, there’s a good chance you know about these spectacular little sensory Water Beads. If it hadn’t been for the magic of the internet I never would have known these even existed, let alone tried them as a tool for exploration and discovery. 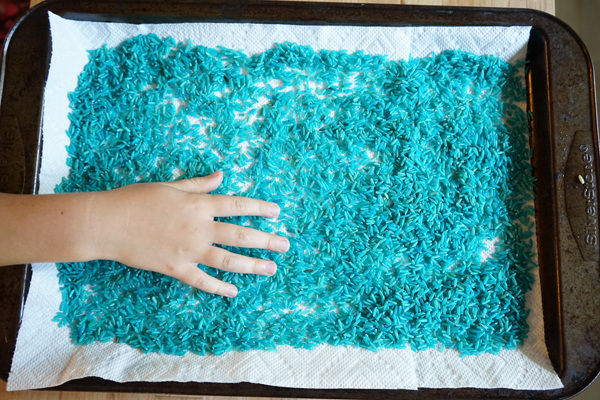 They’re designed to hydrate plants, but they can also be used in sensory play and I’ll show you how. Water beads a non-edible bead, about the size of a blueberry, made of a combination of water and a water-absorbing polymer. A polymer is made of of tiny particles that stick together and form long chains. They sometimes come pre-soaked and also come dry, waiting to be soaked in water. 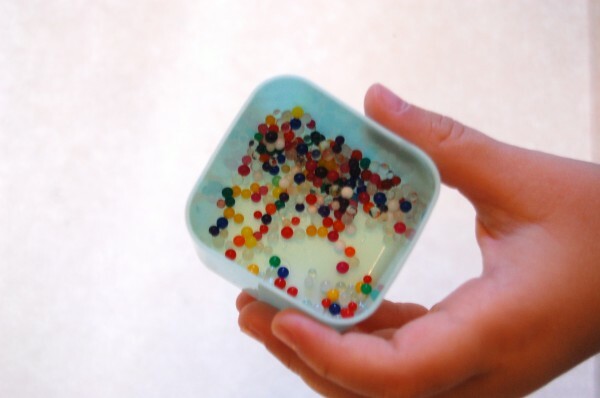 When dry water beads are immersed in water, they fill up and expand like a sponge. 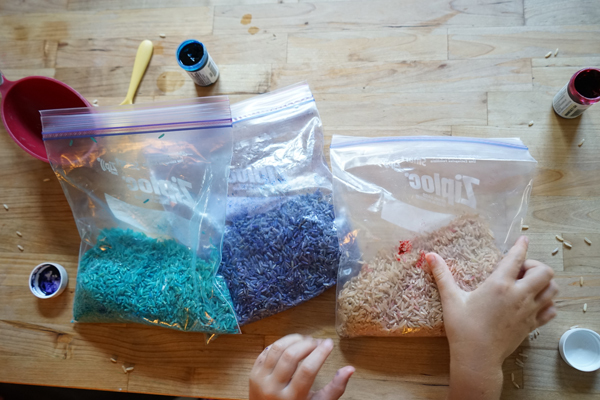 Water Beads: I found ours in the floral section at JoAnn Fabrics, but if you can’t find them near you, you can easily find them on Amazon. 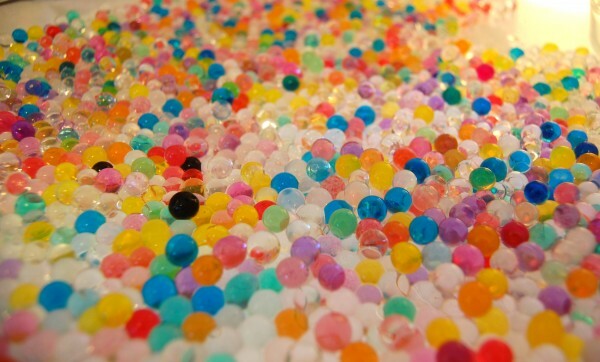 This set is a great deal: Almost 4000 water beads for under $7. Container with edges. We used a clear acrylic tray here and have also used a large under-the-bed storage container. 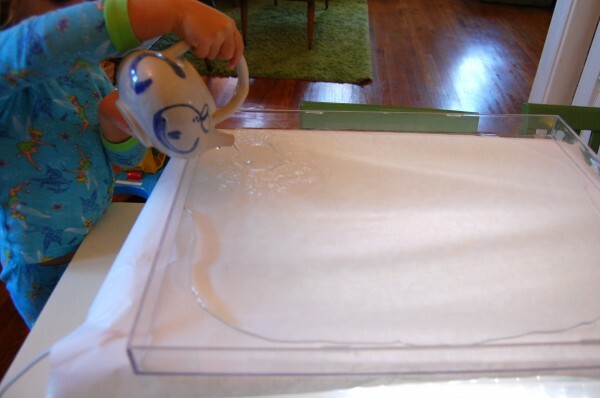 I set up our DIY light table and then N filled the top with about 1/2″ of water. 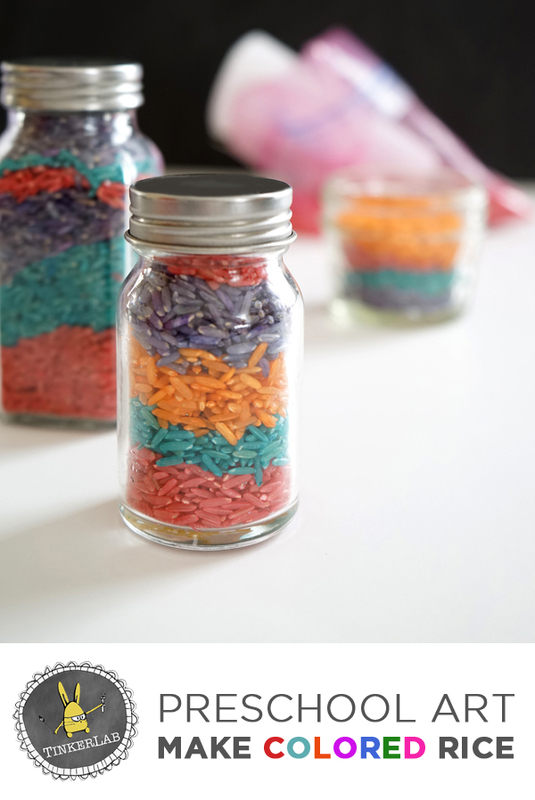 Pour the tiny aqua gems into a small container for for your child to add to the water. 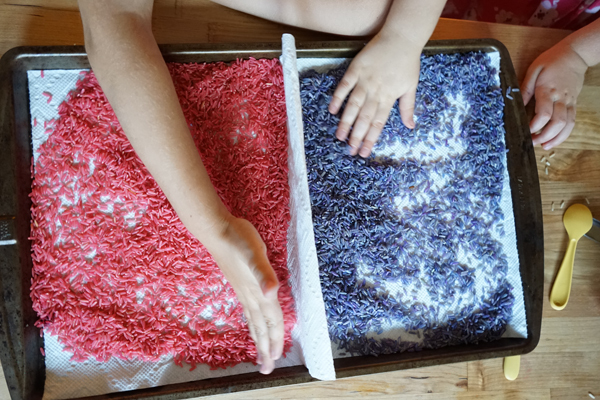 Scoop the beads and drop them in. Watch them grow. 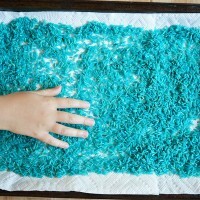 This is great for teaching patience, and it’s fascinating to watch the beads absorb water. As my child mixed them up, we marveled at how they grew….slowly….growing….slowly…(good lesson in patience!). N played with them while her sister napped and we set them aside for a couple hours. After snacks and a romp outside, this is what they looked like. And it turned out that 14 month old Baby Rainbow enjoyed them even more than big sister. I was super cautious at first because little things that look like food go in the mouth, but after a few watchful “not for eating”comments, she was good to go. One last thing, the beads look really cool with light shining through them, but it’s not a deal breaker if you don’t have a light table. 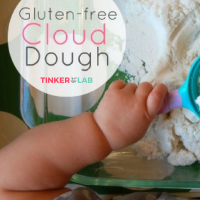 A clear bowl on a sunny day or in a well-lit room will work well too! 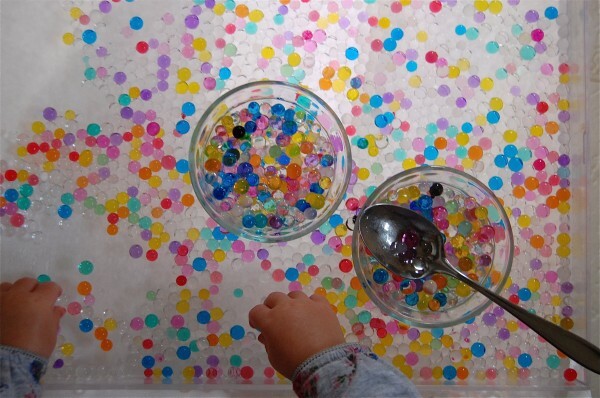 Are water beads safe for kids? Water beads are safe. They’re non-toxic and biodegradable. However, they cannot be eaten! 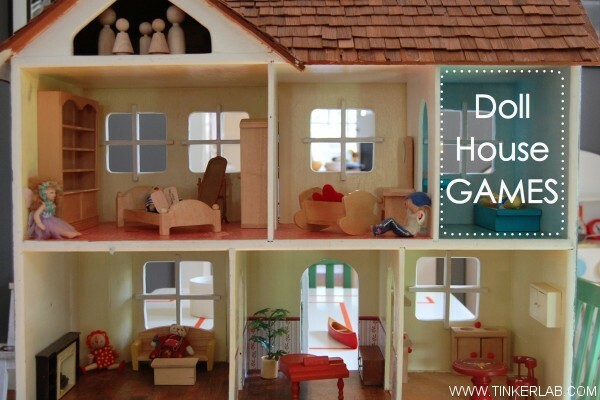 These are best used with older children who aren’t mouthing objects. 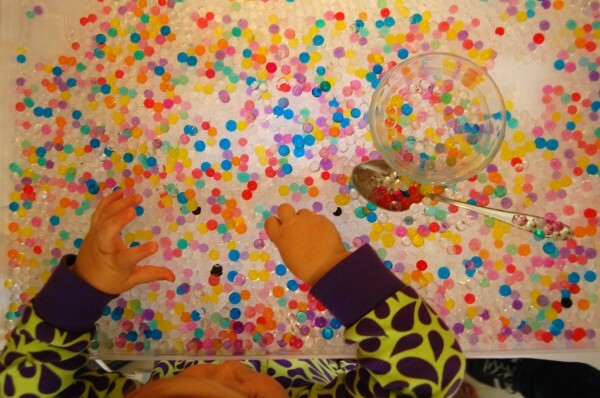 My 14-month old was well-supervised when playing with these water beads. Please use your best judgment when introducing young children to small objects. They can last for a couple years, unused! 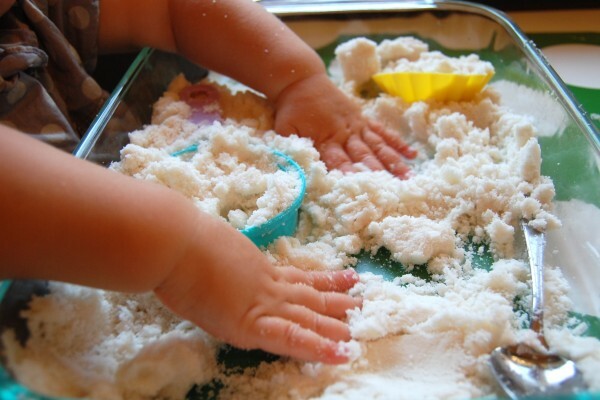 However, once children play with them, they can become magnets for mold and should be tossed after a couple weeks. 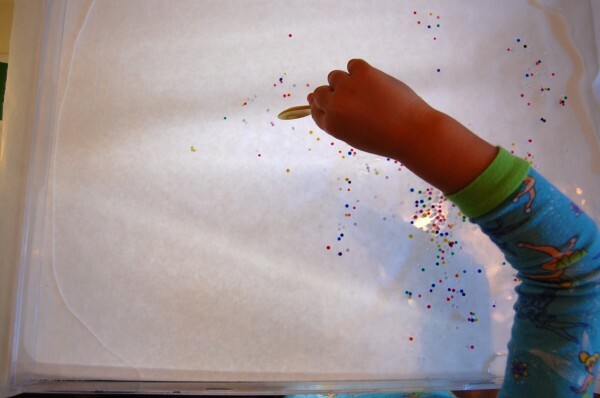 If you see black spots appear on your water beads, it’s time to pitch them. Did you know that yesterday was International Mud Day? 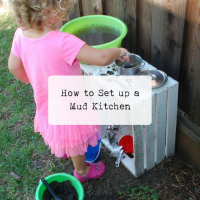 One of my fondest childhood memories is pretending to feed my friend Alexandra’s cat the ooey gooey mud pies we made in her garden, and my hope is to instill my own child with a similar joy for mucking around and being comfortable in nature…and mud, even! 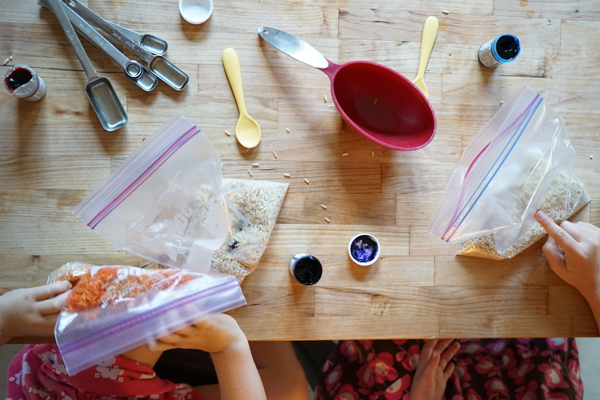 I wrote about our new Mud Pie Kitchen two weeks ago, and since it’s still a popular place to hang out I thought we could move into phase two of our kitchen remodel and talk about mud pie kitchen accessories. This, of course, involved an educational trip to the Goodwill for some new tools and appliances and N was eager to go. 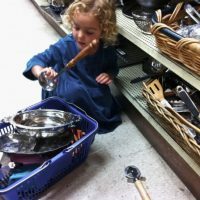 My two little kids and I scooted quickly past the fragile knick knacks and dishes (phew! ), and made our way to the metal and wood aisle. N picked out everything you see in the basket while I acted as her guide, making suggestions and occasionally vetoing her choices (she really wanted that pizza wheel up there, which was smartly taped off). 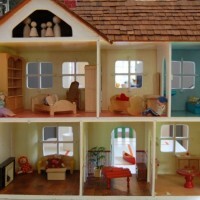 The biggest score was a pink and blue plastic toy called the Fluff Factory, which you can see buried in her basket. It was reminiscent of a meat grinder, and I couldn’t wait to find out what its original purpose was. It turns out that it’s used to fill teddy bears with fluff. How awesome is that? N had no idea of its purpose, but she saw potential in it and I love that even more! 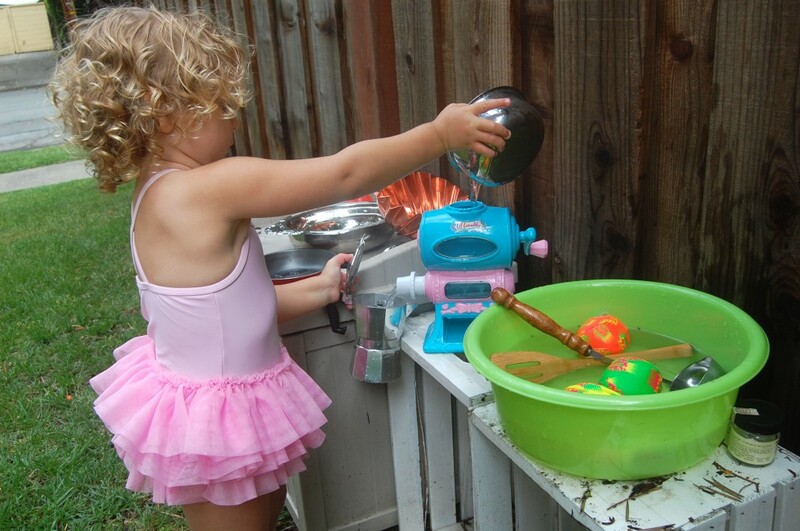 When we got home there was the requisite costume change into the tutu bathing suit (for her, not me) before unveiling the new pots and pans. 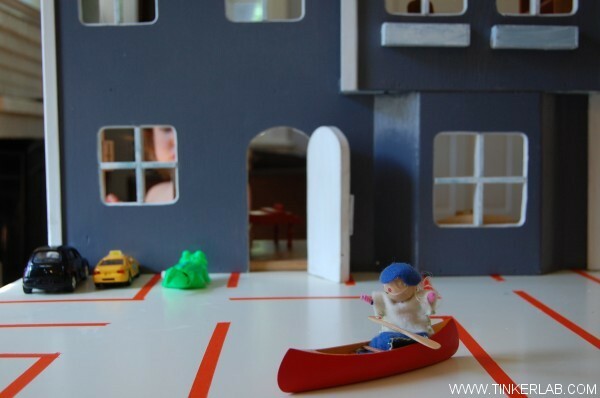 And while these new goods were for our MUD pie kitchen, it was all water play without a speck of mud in sight. N loved her new coffee pot (just $3! 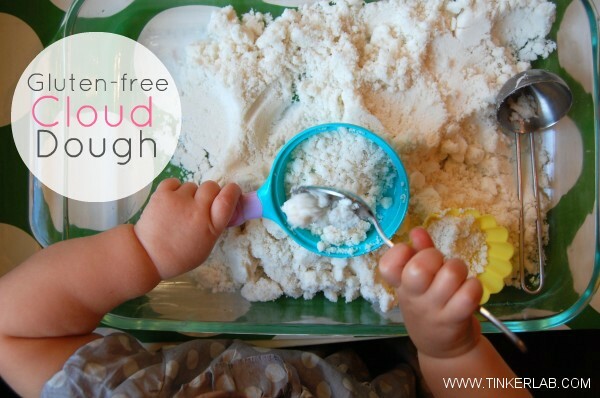 ), kid-sized REAL frying pan, and of course, the Fluff Factory. To accomodate our expanding collection of dishes and such, we added some more counter space, which helped tremendously. 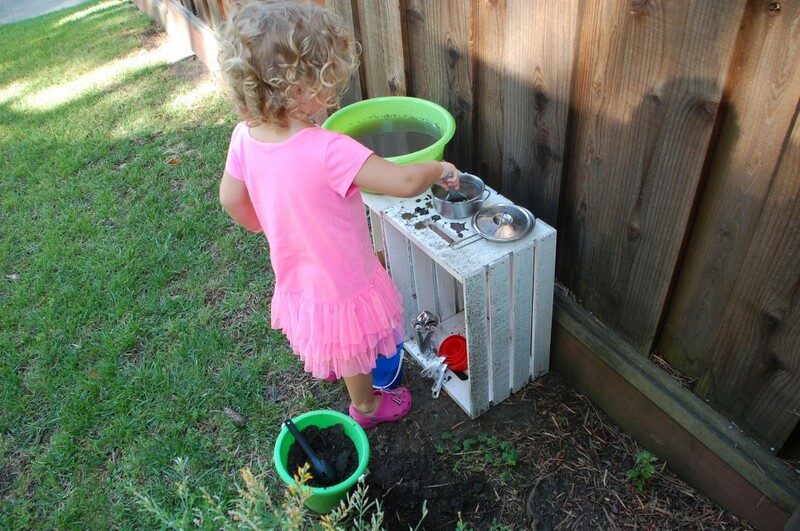 She spent the rest of the afternoon pouring water and dropping flower petals into the little factory and turning the crank to push the water through. Problem solving at its finest. Oh, and maybe next time we’ll actually play with mud! Shop for materials at a second hand store. 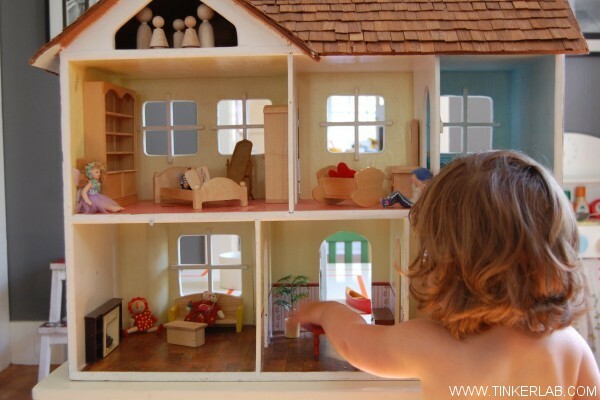 You never know what you will find, which can help you (and children) see the potential in surprising objects. 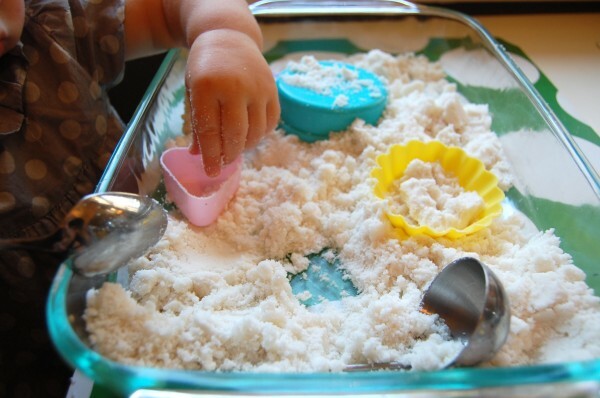 Involve children in the design of the kitchen. Purchasing her own kitchen supplies raised N’s eagerness to use them. 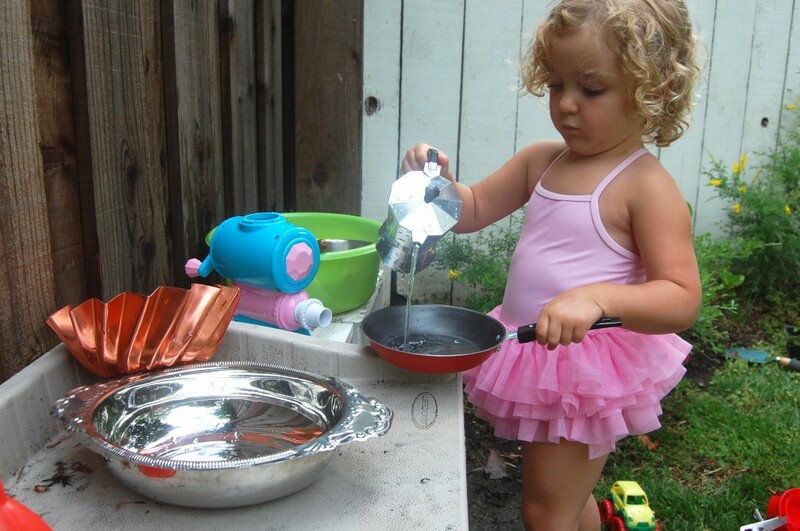 She talked about playing with her new pots all the way home and couldn’t get into her bathing suit fast enough. 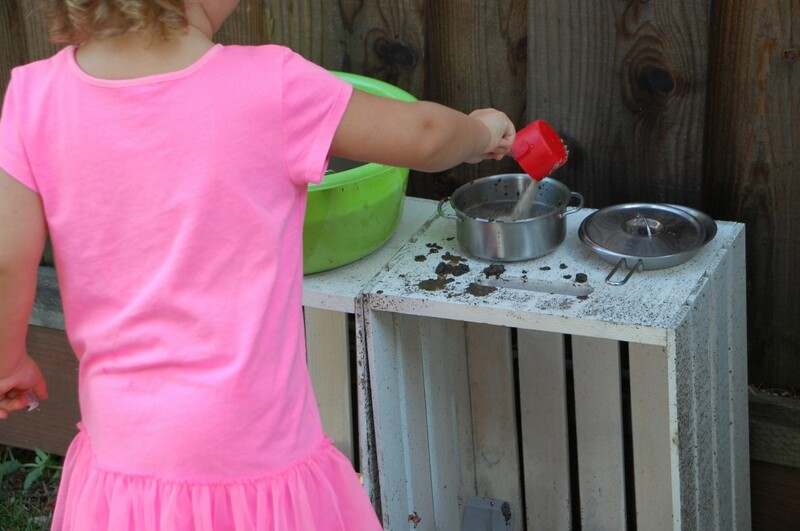 This may not look like much, but we’ve been testing our mud pie kitchen and getting a fresh perspective on what works. It used to reside in another part of our yard, and I thought that moving it might make it more accesible. And it did!! 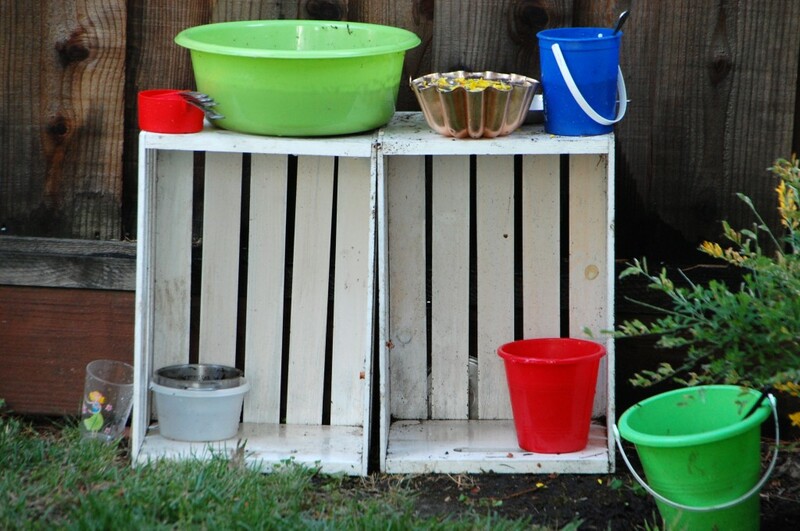 I fashioned the stove/sink from two wooden crates I found at a craft store last summer. 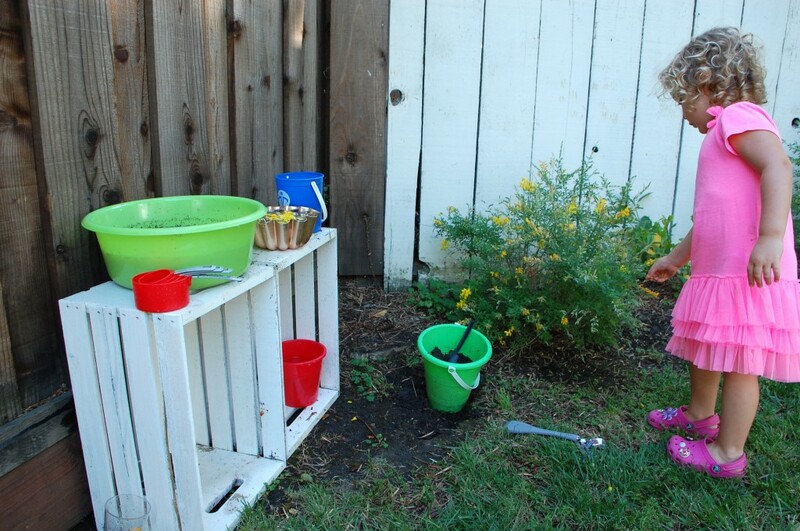 Next, mud pie tools were gathered from our sand box: buckets, bowls, and a jello mold picked up at a second hand store for a dollar. 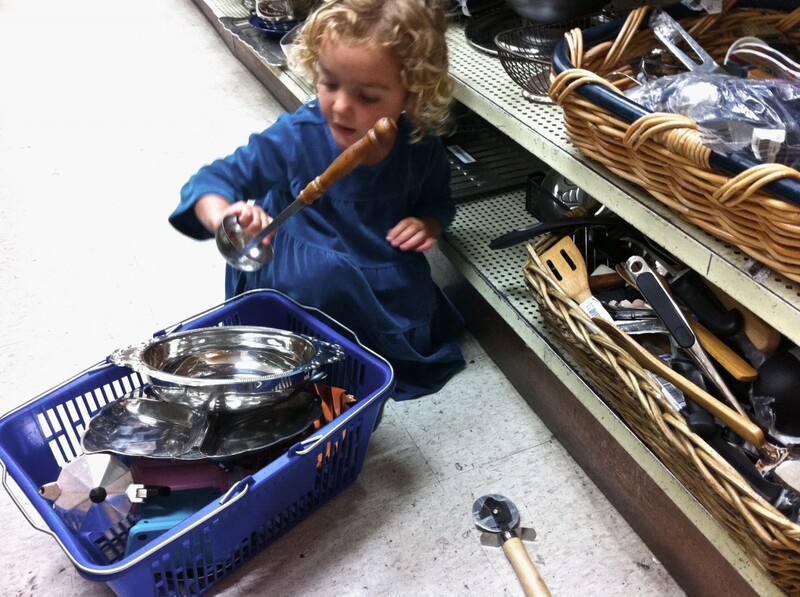 We got the measuring cups at our last trip to IKEA, and carried pots and pans outside from the indoor play kitchen. I filled the big green tub with water and we called it the “sink,” and N got busy making soup. She owned the kitchen right from the start and there was no end to what she wanted to create. The sink got muddy pretty quickly, so she requested another pail full of clean water. Some kids love the mud, mine tolerates it. The kitchen was set up next to some flowery bushes, which made for a convenient food pantry. 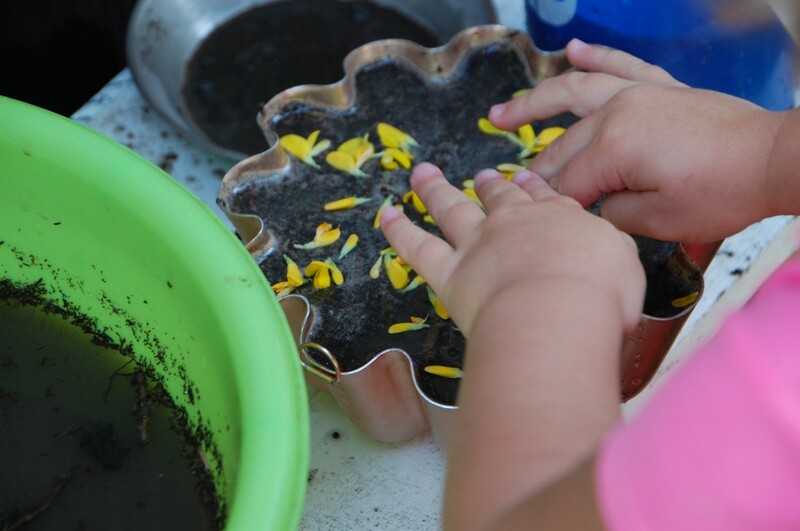 She carefully pressed flowers into the mud like sprinkles on a cake. The contrast was gorgeous. We started this pretty late in the day, and she would have played out there all night if she could have. She actually told me that she wanted to skip dinner because she wasn’t hungry. So I guess the whole test kitchen thing went well! When she was all done, we poured the dirt back into the ground and the kitchen is ready for our next cooking adventure.